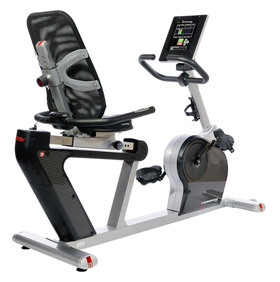 The Diamondback Fitness 510SR Recumbent Exercise Bike is a mid priced home bike with many features and solid quality. Recumbent bikes have back support, and are easier to mount. The Diamondback 510SR will provide a low impact cardiovascular workout with low impact on your joints. The Diamondback Fitness is a well rated brand of exercise equipment. The Diamondback 510SR features a balanced flywheel, which creates a secure, quiet, vibration-free workout, as well as 16 levels ECB magnetic resistance. ECB is the best type and quiet form of magnetic resistance. Diamondback provides 20 workout programs. The walk-through frame gives you easy access to mount and dismount. Fully adjustable ergonomic seat. Diamondback 510SR Recumbent Bike Features: Easy to read, bright blue backlit LCD display, numeric keypad offering real-time workout feedback. (Data includes Time, Distance, Speed, Resistance, Heart-rate, Calories burned, RPM, and Watts.) Integrated Speakers sound system for listening to music on your iPod, or MP3 player while you exercise, including a USB charging port. Pulse grip heart rate monitoring and heart workout programs. Variable Workout Fan (keeps you cool during your workout). Water bottle holder. Foldout magazine rack. Bike Warranty: Lifetime warranty on the Frame & Brakes; Parts & Electronics 3 years; Labor 1 year; Wear Items 90 days. Smart-Review Commentary: The Diamondback 510SR exercise bike is an excellent mid priced recumbent bike for home use. It is Diamondback’s lowest priced recumbent bike. This model should fit most needs as its maximum user weight is 300 lbs. It is loaded with convenience features, and comfort features (cooling fan, stereo speakers, water bottle holder, magazine holder). This model has heart rate grips and heart rate programs. The heavier frame is built for added stability (this model weighs more than similar bikes in this price range). This model has excellent consumer reviews, and an excellent warranty. Toe straps are included. The Diamondback 510SR is a Smart-Review Top Pick for exercise bikes.